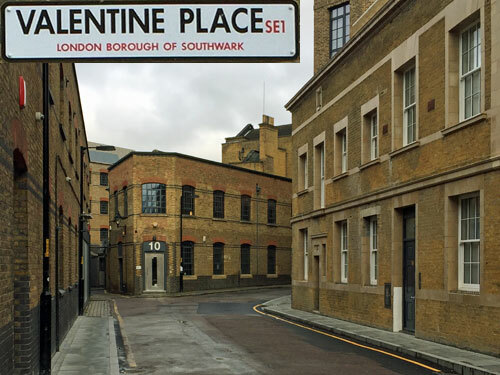 London has seven streets named Valentine. 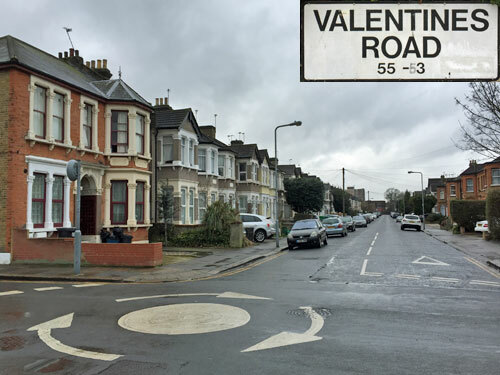 I haven't been to Valentine Avenue in Bexley, Valentine Road in Harrow or Valentines Way in Romford. But I have been to the other four. Initially this brief narrow street doesn't look promising. It peels off from Blackfriars Road between office blocks, a few minutes south of Southwark station. The first office block has been named One Valentine Place, in that numerical way developers have of making somewhere sound much more important than it really is. As yet they've not been fully successful in letting Three Valentine Place, which goes to show. But look to the left of the bored security guard at the front desk, and a lush courtyard behind an iron gate drops hints that something else is going on. What lies ahead is the Valentine Place conservation area, rapidly knocked up by Southwark council when it looked like the Maltina bakery building was about to be knocked down. Various former industrial buildings line the street, faced in attractive yellow brick, with a bollarded alley bearing off to add additional character. But on the southern side it's only a facade, and what now lies behind is a luxury development of apartments and duplexes focused around a communal garden. "The perfect location" trilled the brochure, hence the £¾m+ pricetag, but residents can walk to Waterloo station in five minutes so that's their commute nullified. 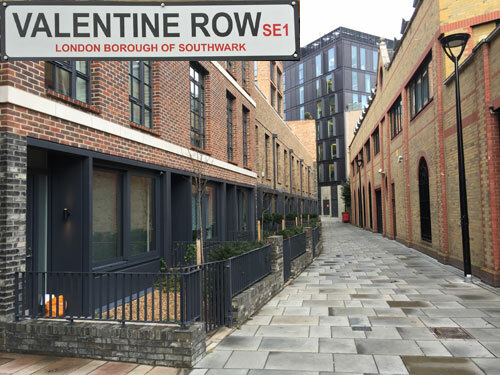 Perhaps unsurprisingly, Valentine Row leads off from Valentine Place. At the end of the 18th century it led diagonally off the main road, but was later nudged back behind a new row of shops and so become an insignificant alley. When the bakery site was reimagined a few years ago the developers thought this would be the ideal spot for five mews houses, very much of the modern vernacular, and stuck each on the market for a fiver less than two million. Residents now enjoy three-storey luxury in spacious Sonos-wired rooms, and a tiny front garden scattered with gravel, although the view across the street is of the back of a car park, which I see the marketing entirely failed to mention. 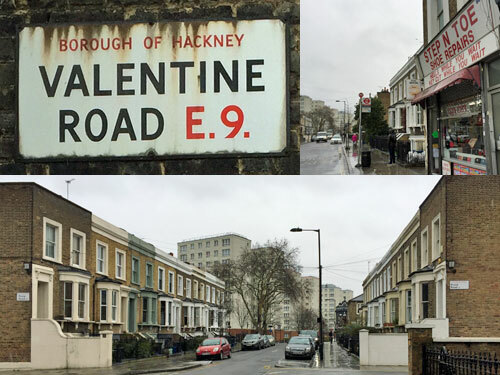 For a very different street, head to Hackney, whose Valentine Road is a single thread of the dense Victorian neighbourhood between Homerton High Street and Victoria Park. Up one end is Well Street, home to the street market where Tesco started, and at the other end a pub once voted the Most Loved in London. Some of the houses are postwar flats, but the majority form uninterrupted flat-roofed terraces, with bay windows downstairs and tiled steps leading up the front door. This is a neighbourhood on the rise, but not yet gentrified beyond repair. All the commercial life is at the western end, kicking off with a pizzeria with a smartly branded red neon sign. Time Out's readers are less likely to find Step N Toe Shoe Repairs, whose signage promises mundane stuff about heels and keys, but whose window is packed with handbags and leather goods. Valentine Road also has a carpet and wood flooring warehouse, called Carpet & Wood Flooring Warehouse, which helps keep the horizontal surfaces of E9 in trim. Oh, and the number 26 bus passes through, one-way only, picking up passengers from the street's very own Bus Stop M.
The Victorian estate to the north of Ilford High Road, with streets named after Prime Ministers and outposts of empire, is more aspirational than the terraced grid to the south. Valentines Road is the last avenue before the park, about ten minutes from the shops, and far enough away to be ever so quiet. One end starts with a wiggle round what used to be the parish church, but which was knocked down in 1977 and is now flats. 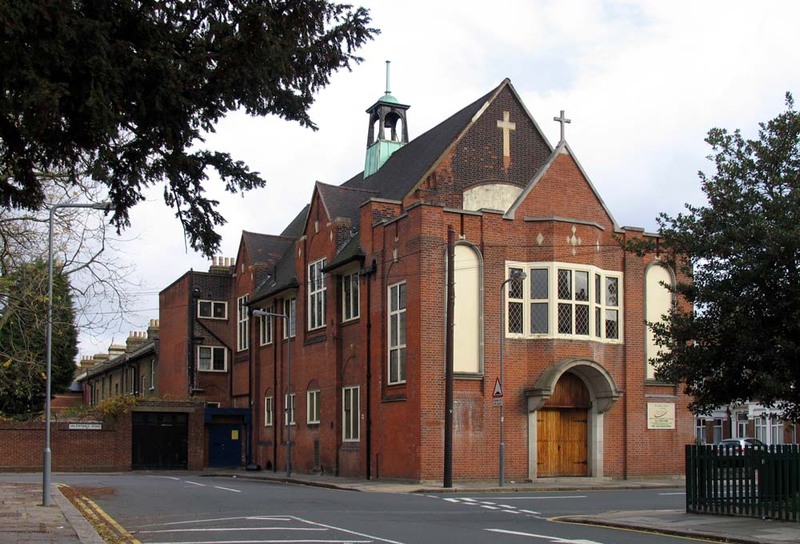 As an indication of how things change the former church hall has become the dominant building, and is now a thriving evangelical place of worship, as well as being home to the Redbridge Foodbank. 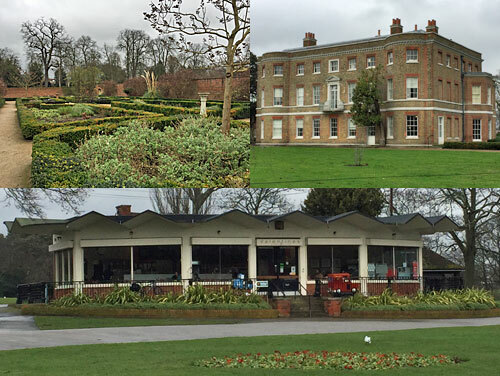 Valentines Park is huge, and the recreational centrepiece of the borough of Redbridge. It's what remains of the estate of a country house called Valentines, which helps explain the ornamental lake and walled garden at the northern end. A lot of the remainder is sports pitches and recreational space, but there's also a boating lake, a bandstand and two economically independent cafes. On a miserable day in February, I reckoned there were more people in the cafes than across the remaining 130 acres. And Valentines Mansion still stands, a restored 17th century abode reopened to the public on Valentine's Day 2009. It's part museum, part artists' studios and part 'large building the council hope you'd like to hire', which perhaps helps explain why the second series of the Great British Bake Off was filmed on its lawns. Normally it only opens on Tuesdays and Sundays, but in school holidays they do Mondays and Wednesdays too, which is ideal if you fancied a Valentines visit today. Better here than any of the other streets I've been writing about, that's for sure.